Why Be a Baldrige Examiner: "A Thirst for Learning, Collaboration, and Volunteerism"
If you look closely at the cell phone screen in the photo below, you will see the front cover of the Baldrige Excellence Framework (PDF version). The woman in the photograph—who spent many hours using that framework as a Baldrige examiner in 2018—is Christy Hunter. She is an OB-GYN who practices in an independent physicians’ group in Charleston, SC, in which she is also a business partner. Those who know her great intellectual curiosity and drive to perform at high levels in all areas of her life are not surprised to learn that medicine is not the only sector in which Hunter has experience and expertise. In fact, after earning an undergraduate degree in biomedical and electrical engineering from Duke University, she worked for a manufacturing business before attending medical school. Last year, she decided to add a new challenge to her demanding schedule of delivering babies, managing a business, and tending to the needs of her family: she became a new member of the Board of Examiners for the Malcolm Baldrige National Quality Award. In the following Q&A, she highlights how she became interested in serving as a Baldrige examiner, how she balanced this volunteer work with her career and personal responsibilities, and the value she sees in Baldrige volunteering. How did you first become interested in being a Baldrige examiner? I became interested in being a Baldrige examiner when attending the University of Tennessee in a physician executive MBA program after my advisor exposed our class to the Baldrige Criteria for Performance Excellence (a crucial part of the Baldrige Excellence Framework booklet). One of our projects was to study the Baldrige Criteria and write an Organizational Profile [the prefatory section]. I used elements of the framework to develop an organizational action project that was a capstone graduation project. What were your impressions and highlights of your first training (the Examiner Preparation Course)? My initial impression was that “I had found my tribe.” New examiners spend an additional day at the beginning of training. I really like that every Baldrige training class began with a personal introduction of each participant. Despite the large gathering in our room, we spent time going around the room with introductions. Despite differences in employment sectors and home cities and states among the participating examiners, the room was filled with people who shared a thirst for learning, collaboration, and volunteerism. Would you please share your memorable experiences as a new examiner on a Consensus Review team (the second phase of the annual Baldrige Award process)? My most memorable experiences during Consensus Review came after studying the Criteria and coming back together for discussions. I was amazed that eight people [on the examiner team] could read a 50-page Baldrige Award application independently and come to consensus in assessing the organization in such a short period of time. I was struck by the dedication of the examiners to providing a highly detailed assessment and by the respect everyone had for the applicant. Also, I was impressed to realize that organizations that apply for the Baldrige Award are not just going through the Baldrige assessment and improvement process to meet the expectations of organizations in their respective sector, but rather, to exceed those expectations. In the dynamic health care environment today, it may be easy for some organizational leaders to feel overwhelmed by the demands of meeting regulatory requirements alone, so I find it refreshing that Baldrige Award recipients face the regulatory challenge and also help other health care organizations [by sharing best practices] along the way. Similarly, would you please share your impressions and insights from being on a site visit (the third and final phase of the award process)? I certainly could not have completed a site visit without the help of more seasoned colleagues. Observing senior examiners interview the applicant's workforce was invaluable for me. My understanding of the Baldrige Criteria was solidified as the interrelation of each category became evident through that experience. I feel privileged that I was on a site visit with people who believe in excellence in all that they do. The atmosphere is one of mutual learning and personal development for the site visit team and the applicant. Where is your favorite place to “Baldrige” (i.e., complete examiner training prework or independent assignments as part of a Baldrige Award assessment)? My favorite place to “Baldrige” is the beach near my home in Charleston, SC. I received my Baldrige Award application [for the Independent Review] just prior to going on a family vacation there. I enjoy waking up early; getting a strong cup of coffee; and opening my computer, the Baldrige framework booklet, and the application to work on the assignment. Have you applied learning from your service as a Baldrige examiner to your work as a medical doctor? Yes, I have applied my learning daily. As I went from examiner training last spring, to Independent Review and Consensus Review last summer, to Site Visit Review in the fall, the Baldrige Criteria became familiar to me. Having “lived” the Baldrige framework over several months, I find that using this resource is now second nature for me. I can use these questions to help leaders in our organization focus on doing what will increase our success in accomplishing what is most important to us. Beyond my organization, when I network with others in my field, I can use the questions to learn from how they lead their organizations. How do your colleagues and family and friends view your service as a Baldrige examiner? My family truly knows what “Baldrige season” is. My ten-year old asked me more than once why I was doing this work and whether it was voluntary. She and my 13-year-old were well aware when I was on Consensus Review conference calls because we had many dinners early or late (or food from the drive-through) to accommodate those Baldrige meetings. The week I was away for a site visit was made possible only through a lot of extra help from my husband. However, the value of my personal development and the potential for my leadership development were worth the sacrifices. My children learned something valuable, as well: they know that there are rewards for such work beyond monetary gain. Would you please reveal the location where you most recently took a photo with your Baldrige framework booklet (on your phone screen)? 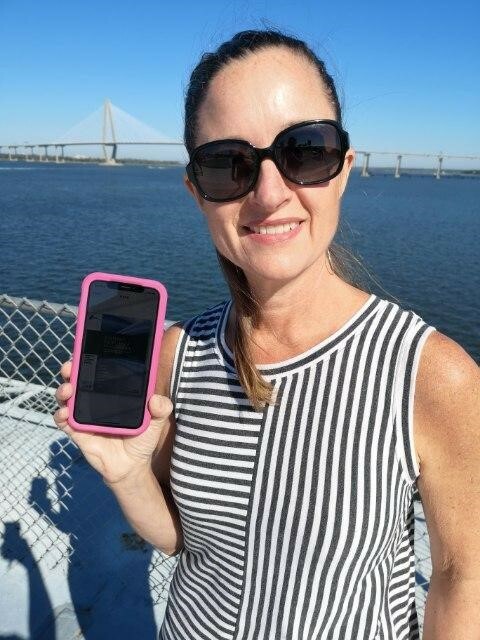 I was aboard the U.S. Yorktown in the Charleston Harbor, near the Cooper River Bridge, during a basketball tournament (where one of my daughters was playing). The 2019 Board of Examiner Application will be open from November 26, 2018, until January 7, 2019, 6:00 pm ET. Dr. Christine Hunter makes simple but enduring points in favor of the Baldrige Performance Excellence Program. I have experience as an Excellence Assessor with the South African Excellence Foundation, which drew a lot from this world-class framework. What is valuable is continuous learning experience which the Examiner enjoys when fully applying one oneself and doing Justice to the application. Welcome to the "tribe," Dr. Hunter. You will very soon learn that it will be harder and harder to leave your tribe mates!